Helen Pugh, this week’s Educator of the Week, used the Geo-Inquiry Process as a framework to guide her students in action projects within their school. The Geo-Inquiry Process is a five-step method that builds on student questions and culminates with students taking action based on geographic information they’ve gathered. Working in groups, Helen’s students developed projects related to composting, food-waste reduction, gardening, and more, all with the goal of creating a cleaner school environment. 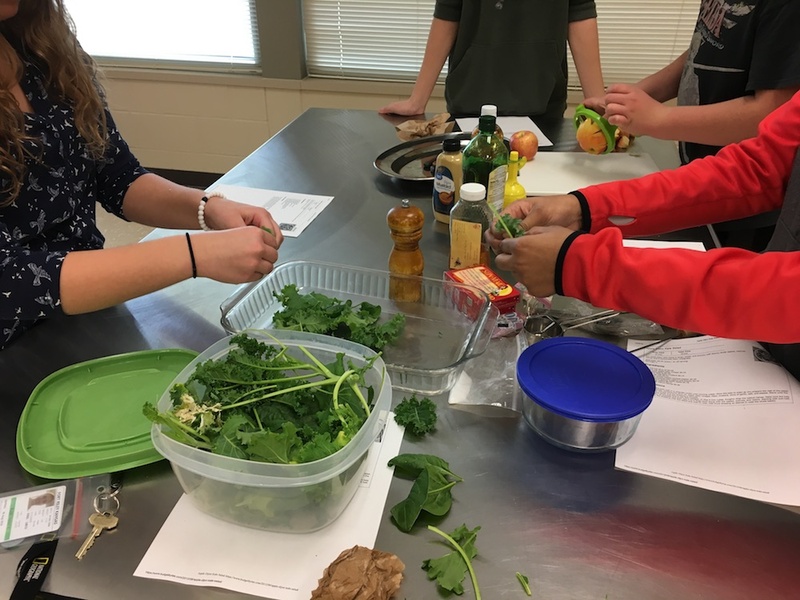 Your students came up with action projects based on a question they developed together: “How can we as Fort Riley Middle School students create a cleaner environment for future generations?” How did they decide what they wanted to do? We’re located on a military base with a transient population, so as a school it can be hard to feel the camaraderie of a community. I asked my students to look at something local that they would like to change. They came up with many ideas, and we chiseled it down to making a cleaner environment. From there, students took various directions based on their interests, naturally dividing into four groups. Especially at the middle-school level, it was pretty cool to see different students with different personalities working together cooperatively and even building friendships in these interest-based groups. One group collected data in the lunchroom and became outraged that whole fruits were being thrown away. They addressed this by making more numerous and prominent “Share Baskets” for uneaten fruit, mapping the cafeteria and examining foot traffic to select the most strategic locations. 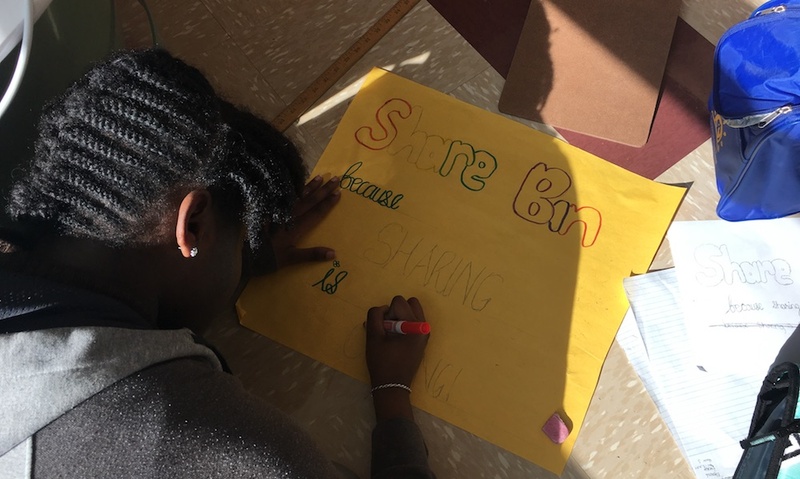 On their own, they decided to film and edit a short PSA for their peers encouraging them to use the Share Baskets. Other groups investigated how we might begin composting at our school, better utilize produce from our school garden, and encourage others to recycle correctly. Why do you think this project was so engaging to your students? I think curiosity played a huge role. They took ownership and came up with the question. It dealt with their school and their peers and making a change, and I think that’s what truly motivated them. When they presented their work to the principal, they dressed up—I didn’t even tell them to do that, but they were just really proud. My students felt empowered by creating a positive change within their school! Throughout the project, they came in every day with the mindset of what they hoped to accomplish, and they would just get started on their own. That’s not a normal middle school classroom! I helped them set goals at the beginning of every week, and then they ran with it. They started with the path I created for them, but then they made their own paths and followed their own ideas. It can be a little uncomfortable at first to have the students take so much control, but once they do, it’s really rewarding. I embraced their curiosity, and while it was a learning curve for sure, the outcome of student engagement and thought process was incredible. Their creative side was elevated as well as their team-building. It sounds like this became a really exciting and extensive project. How were you able to fit it into your curriculum? I was fortunate enough to be teaching an extension class (for students who have met or exceeded math and reading standards), which allowed me to dedicate a lot of time to the Geo-Inquiry Process. At first, I struggled to think how I could do a project like this in my U.S. history class. But now that I’ve gone through the process, I’m starting to think of how easily I could do similar work within my history classroom in a much shorter timeframe. I can see how I might incorporate this process into our studies of the Trail of Tears or the Underground Railroad, and I also see opportunities for cross-curricular work with our language arts teacher. It is not my job to convey information to students; it is my job to captivate them into wanting to learn and apply the information. My inspiration comes from my students, who inspire me to come up with creative ways to teach them—“If a child can’t learn the way we teach, maybe we should teach the way they learn,” as the saying goes. They expect to be moving around the room, to be engaged with one another, to hold one another accountable and to learn from one another.